Food Costs > How Much Do Scallops Cost? How Much Do Scallops Cost? Scallops are found all over the world in any ocean and are a common food usually found in seafood restaurants in dishes such as pasta or even just sauteed in butter. 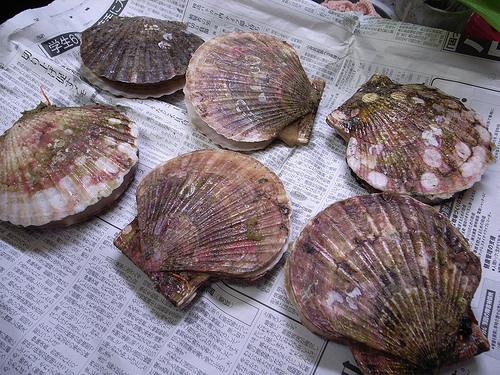 Retailers will either sell the scallops already prepared in the shell or sell it with the muscle intact. Outside of the United States, scallops are usually sold whole. The price of scallops depends on the form, quality, quantity, and where you purchase it. Smaller scallops, which are known as bay scallops, are going to cost less than a larger scallop. On average, prepare to spend anywhere from $11 to $35 per pound at a local fresh fish market. The fresher they are, the more you are going to pay. At Costco, for instance, a box of two pounds can cost close to $36. For a bag of frozen scallops commonly found at your local grocery store, the price is going to range anywhere from $6 to $9 per pound. While these are still considered scallops, the quality is a lot different compared to a fresh purchase. Diver scallops, which are a sea scallop that has been picked by hand by a diver, can be more ecologically friendly and will be less gritty when compared to a boat-harvested variety. A dive scallop can be a bit pricier, retailing for close to $40 per pound. Scallops that have been boiled and canned can cost anywhere from $1 to $3 per can, depending on the ingredients added. Most canned scallops are commonly soaked in salt to preserve their freshness. According to some forum members on Chowhound.com, some saw scallops for $29 per pound at Whole Foods, while another saw them for close to $30 per pound in Chicago. At Shop Rite, one pound of scallops retailed for $18. Day boat scallops, a popular upscale scallop harvester online, sell them for about $28 per pound and are delivered by hand on location. Raw scallops will come either fresh or frozen and will be either handled dry or soaked. Dry scallops, which is the seafood industry term for natural scallops, won’t be treated for phosphates and will be slightly tan, almost “vanilla” in color. Unlike soaked scallops, dry scallops won’t have water added to it. Dry scallops are recommended for searing, and when compared to a soaked version, it has a more natural taste. Soaked scallops will be soaked in what’s known as a bath of phosphates for the purpose of adding water weight. When they are exposed to this mixture, the scallops will absorb it and swell, allowing the scallop to gain water weight. This, in turn, allows the processor to get more money since the weight will be inflated due to this unnecessary water. When the soaked scallops are cooked, the water will evaporate, shrinking the scallops in size. Scallops purchased through online retailers will more than likely charge an additional shipping fee if a minimum is not met. Fresh scallops will have to be shipped using dry ice and will be shipped overnight to preserve the scallop’s freshness. For the baking method, keep in mind that scallops can toughen up quickly. Because of this, you’re going to want to make sure that you watch them at all times while cooking. To bake, simply throw them in the over for 10 minutes at 375 degrees, and wait until they are white in color before consuming. To saute the scallops, dip them in milk and lightly dust them with some flour. Throw some butter in a pan and cook them until they are browned on each side. Again, don’t overcook them or they will begin to have a rubbery taste and appearance. Most experts are going to recommend that you saute them for the maximum amount of flavor. If purchasing on a store shelf or at the local seafood counter, be sure to ask if it was farm raised or wild caught. The difference between the taste and for health benefits is noticeable, according to the Mayo Clinic. Even if it’s wild caught, it still doesn’t mean it’s a great choice as you will still want to know where the scallops came from. Most experts recommend sticking to scallops that came from North America, not overseas in countries such as China and Thailand. The term U10, which is commonly seen online, will mean there are 10 or fewer to a pound, meaning the scallops will be larger than average. Fresh fish markets are not only going to have the best in terms of quality, but their prices are comparable to gourmet websites online. Why wait two to three days to receive your seafood, when you can get it in person instantly? Check your local grocery store to see what they can offer as well since some, such as Costco and Sam’s Club, offer seafood and certain days, usually during the weekends.